Denison was founded in 1872 in conjunction with the Missouri–Kansas–Texas Railroad (MKT) or "Katy" depot. It was named after the wealthy Katy vice president George Denison. Because the town was established close to where the MKT crossed the Red River (both important conduits of transportation in the industrial era), it came to be an important commercial center in the 19th century American West. In 1875, Doc Holliday had offices in Denison. During the phylloxera epidemic of the mid-19th century, which destroyed the vast majority of wine grapes in Europe, Denison horticulturalist T.V. Munson pioneered methods in creating phylloxera-resistant vines, and earned induction into the French Legion of Honor, as well as sister city status for Denison and Cognac, France. In 1901 the first electric "Interurban" railway in Texas, the Denison and Sherman Railway, was completed between Denison and Sherman. In 1915, the Kentucky-based evangelist Mordecai Ham held a revival meeting in Denison, which resulted in 1,100 professions of faith in Jesus Christ. Denison played host to 20th century notables such as the Marx Brothers and President Dwight D. Eisenhower, who was born on October 14, 1890, in Denison. 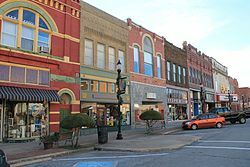 Denison is located in northeastern Grayson County, with the city limits extending north to the Red River, which forms the Oklahoma state line. It is bordered to the south by the city of Sherman; the city centers are 11 miles (18 km) apart. According to the United States Census Bureau, Denison has a total area of 23.4 square miles (60.7 km2), of which 23.0 square miles (59.6 km2) are land and 0.46 square miles (1.2 km2), or 1.94%, are water. Denison Dam, which forms Lake Texoma on the Red River, is 5 miles (8 km) north of Denison. The city is in the center of the Texoma region, encompassing parts of Texas and Oklahoma. Denison has a humid subtropical climate. At the census of 2000, there were 22,773 people, 9,185 households, and 6,135 families residing in the city. The population density was 1,008.1 people per square mile (389.2/km²). There were 10,309 housing units at an average density of 456.3 per square mile (176.2/km²). The racial makeup of the city was 84.02% White, 8.62% African American, 1.67% Native American, 0.46% Asian, 0.06% Pacific Islander, 2.19% from other races, and 2.98% from two or more races. Hispanic or Latino of any race were 5.23% of the population. There were 9,185 households out of which 29.8% had children under the age of 18 living with them, 48.1% were married couples living together, 14.4% had a female householder with no husband present, and 33.2% were non-families. 29.1% of all households were made up of individuals and 14.4% had someone living alone who was 65 years of age or older. The average household size was 2.43 and the average family size was 2.97. In the city, the population was spread out with 24.6% under the age of 18, 8.8% from 18 to 24, 26.7% from 25 to 44, 22.4% from 45 to 64, and 17.4% who were 65 years of age or older. The median age was 38 years. For every 100 females, there were 88.9 males. For every 100 females age 18 and over, there were 83.7 males. The median income for a household in the city was $31,474, and the median income for a family was $39,820. Males had a median income of $30,459 versus $21,451 for females. The per capita income for the city was $17,685. About 11.9% of families and 14.7% of the population were below the poverty line, including 21.8% of those under age 18 and 11.8% of those age 65 or over. Denison is served by the Denison Independent School District. At the start of the 2014 school year, a new Denison High School building was completed and ready for use. It is home to Grayson College, which preserves Denison's viticultural heritage with its T.V. Munson Viticulture & Enology Program. Munson Stadium seats 5,262 people and is primarily used for football. It is the home field of Denison High School's football and soccer teams. The Denison High School football team won the 1984 Texas Class 4A State Championship by beating Tomball 27-13 completing a perfect 16–0 record. They also made three straight appearances in the 1995, 1996, and 1997 Class 4A Division II State Championship games, losing each time to La Marque. They are home to the longest high school football rivalry in Texas: the Battle of the Ax, against Sherman High School. Denison is served by two U.S. Highways—U.S. 69 and U.S. 75 (North Central Expressway) and two State Highways—State Highway 91 and Spur 503 (Eisenhower Parkway). State Highway 91, known as Texoma Parkway, is one of the main commercial strips that connects Sherman and Denison. It also extends north to Lake Texoma. General aviation service is provided by North Texas Regional Airport. Denison is served by one 24-hour taxicab service provided locally by yellow cab. Denison is a member city of the regional public transportation system called TAPS, which offers on-demand service, fixed routes to Choctaw and Sherman, and services to Dallas/Fort Worth and Dallas Love Field airports. As of December 2015 TAPS had ceased most operations due to financial problems. Limited service is available for the handicapped. Denison is home to the Eisenhower Birthplace State Historic Site. In 2013 Lake Texoma and the Hampton Inn and Suites Denison were featured on a travel show entitled The Official Best of Texas which aired on CBS and the Discovery Channel. Denison is home to the Grayson County Frontier Village. Frontier Village houses 11 of the oldest homes in Grayson County that were moved here for preservation. There are also 6 replicas on site. These buildings were used to form an 1800s village. Tours are available and there is a museum and genealogy research room for public use. Denison is served by Texoma Medical Center. President Dwight D. Eisenhower was born in Denison in 1890, and to date is the city's most notable resident. His birthplace was purchased by the city in 1946 (six years before he was elected President) and is now maintained as Eisenhower Birthplace State Historic Site. In addition, Eisenhower State Park on Lake Texoma is named in his honor. John Hillerman, the actor who played Higgins on Tom Selleck's Magnum, P.I. ^ Geography, US Census Bureau. "2010 Census Urban and Rural Classification and Urban Area Criteria". www.census.gov. ^ a b c "Geographic Identifiers: 2010 Demographic Profile Data (G001): Denison city, Texas". American Factfinder. U.S. Census Bureau. Retrieved March 15, 2017. ^ DAVID, MINOR, (12 June 2010). "DENISON, TX". www.tshaonline.org. ^ "Introductory history of Denison Texas". ^ a b "T.V. Munson Vidiculture Eunology Program". ^ A., RIEDER, ROBERT (12 June 2010). "ELECTRIC INTERURBAN RAILWAYS". www.tshaonline.org. ^ "the marx brothers - biography". www.leninimports.com. ^ D'Este, Carlo (2003). Eisenhower: A Soldier's Life. New York: Macmillan. pp. 21–22. ISBN 0-8050-5687-4. ^ "TexasBob.com - Munson Stadium - Denison, Texas". www.texasbob.com. ^ "SISD: SHS Battle of the Ax". 11 January 2002. ^ "Search every page of every issue published by Texoma Living! Magazine from 2006 to 2010". Texoma Living! Online. Retrieved 16 July 2015. ^ "Denison Development Alliance: Community Profile". www.denisontx.org. Retrieved 2016-06-04. ^ "Eisenhower State Park — Texas Parks & Wildlife Department". www.tpwd.state.tx.us. ^ "1940 United States Census". ^ Rivera, Ray (2009-01-16). "In a Split Second, a Pilot Becomes a Hero Years in the Making". The New York Times. Retrieved 2009-01-17. Wikimedia Commons has media related to Denison, Texas. Wikisource has the text of the 1921 Collier's Encyclopedia article Denison. "Denison, Tex." . The New Student's Reference Work . 1914. This page was last edited on 8 March 2019, at 18:10 (UTC).